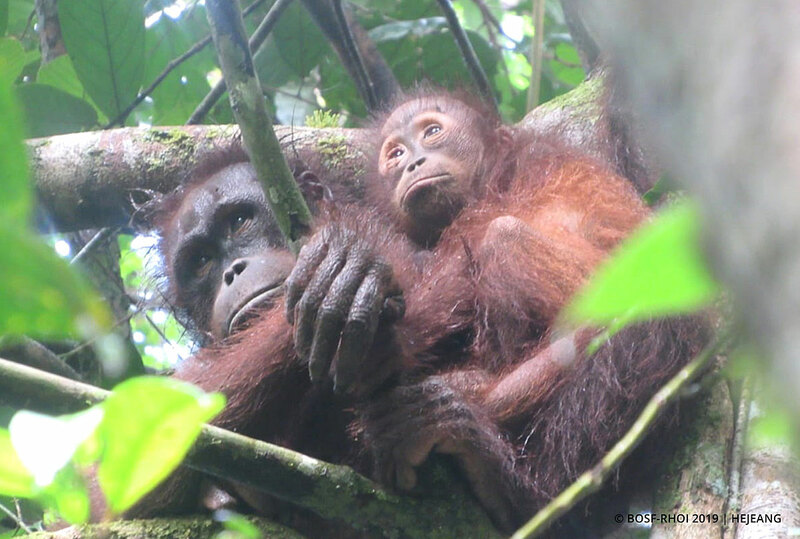 FEBRUARY 4, 2019 — Last week, our Post-Release Monitoring (PRM) team from Nles Mamse Camp in the south of the Kehje Sewen Forest, East Kalimantan, had the opportunity to again observe mother-son pair Signe and Bungaran. 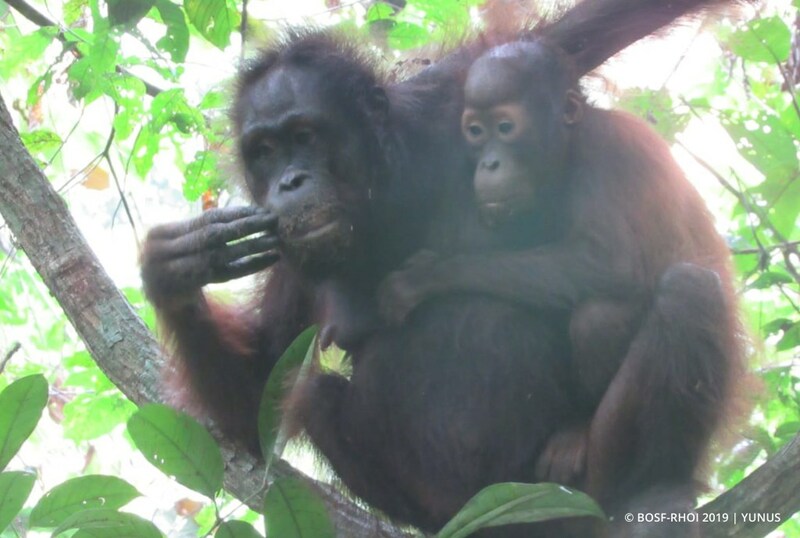 Signe, now 11 years old, was released to the Kehje Sewen Forest together with her then 1-year-old son, Bungaran, in December 2016. On this latest occasion, our PRM team found the pair sitting atop a tree not far from the phenology transect, about two kilometers from camp. The two seemed as close as ever, and were completely unfazed by our presence as they enjoyed foraging and snacking on bark. 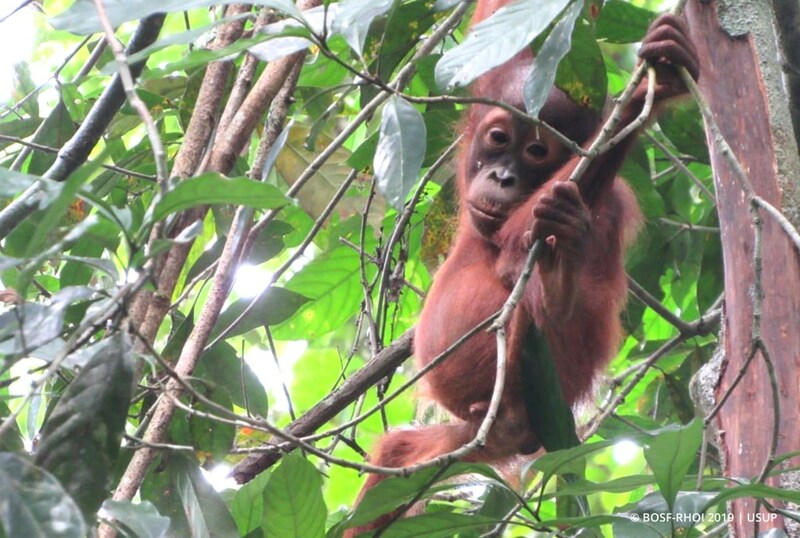 During observations, Bungaran – who at just a little over three years old is growing more independent – bravely roamed a distance away from Signe, who kept a watchful eye over him. He repeated a cycle of foraging and taste-testing new food sources, and returning to his mother every now and then for brief cuddles. This process of ensuring a safe distance between mother and infant is completely natural among wild orangutans, since young orangutans stay with their mothers until the age of around 7-8 years. 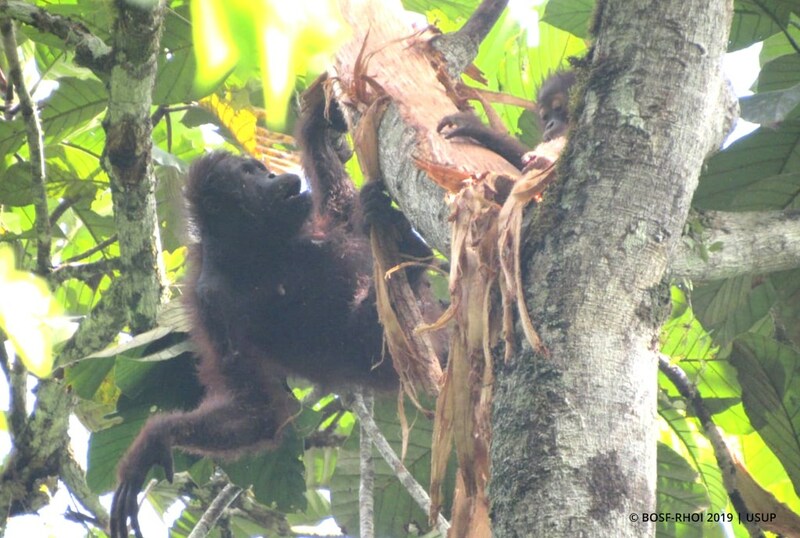 During this particular observation period, members of the PRM team were lucky enough to witness a rather unique interaction between this mother and son: Signe happened to be sitting down enjoying artocarpus fruits when Bungaran suddenly approached and pinched her on the ear. Perhaps this was a signal from a son imploring his mother to join him in play time? Signe was apparently having none of it, and swiped at Bungaran to slap his hand in a show of strict refusal. Bungaran quickly retreated and went back to minding his own business. What happened next involved an amazing display of diplomacy: Bungaran, as it turned out, knew exactly how to remedy the situation. He returned shortly after with some artocarpus fruits cupped in his hand, and approached his mother as though making a peace offering. Signe gladly accepted his offer and the two shared a tender hug. A small gesture nonetheless, this kind of interaction shows us the remarkable ways in which wild orangutans communicate in the forest. Despite the disagreements, they seem to know that the key to surviving and thriving is learning to live in harmony. Perhaps we humans could learn a thing or two from orangutans after all?